This is usually the part of the blog that I ignore and go straight to the recipe so feel free to skip the next few paragraphs. Oh also, I decided to start a food blog so we’ll see how that goes. My baking adventures today were provoked by a co-worker’s birthday. I’m still rather new at the record label and if nothing else than people will know me by my baking. Also, If you don’t already know than you will soon after reading a few of my posts, I love my vegan baking but I especially thrive on cupcakes (who wouldn’t when they were introduced to vegan baking by chai latte cupcakes with cinnamon swirl frosting?). 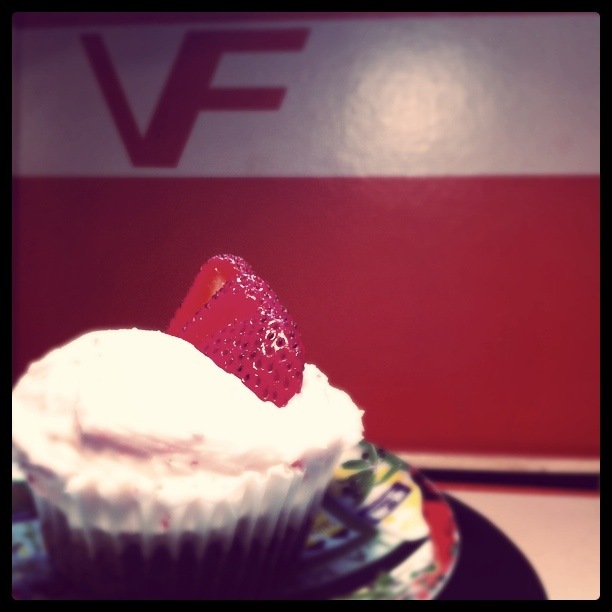 Anyways, so after raiding my fridge and discovering some ginormous strawberries I knew I had to make a vegan strawberry shortcake cupcake for my co-worker. I’ve been in the process of moving and have seemed to misplaced my Isa’s cupcake cookbook that I always turn to (I know. I know. This is the point where you roll your eyes because she is still trying to do that whole ‘punk rock independent girl’ type image that we all got over in the late 90’s/early 2000’s but shhhh because that woman knows how to make a damn fine cupcake). I ended up having to turn to the internet and found a recipe by some food network nominee or something and they turned out pretty damn fine. So all in all, the Vegan Strawberry Chocolate Cupcakes were scrumptious, they are super basic and easy, everyone at work ate all of them, and I had a perfect excuse to make a first post. Set oven to 350 degrees. Fill cupcake pan with [wolf] liners. Mix all the dry ingredients for the cupcake portion in a bowl and blend the wet ingredients in another. Combine the wet with the dry and mix until well combined. Fill the liners with the batter until about 2/3s full and bake for 15-20 minutes. BAM. THAT’S IT. And while those are baking make the frosting. Combine everything in a bowl and mix with a hand mixer. Once light and fluffy, use a spatula for any mix ins you might have (sprinkles, food coloring, chocolate chips, whatever).Oh and slice some strawberries while you are waiting for the timer to go off too. Assemble these vegan strawberry chocolate cupcakes as you please. Then Mow down. Share with your cat. Stare at them. Whatever you’d like. Okay. That’s all I’ve got. 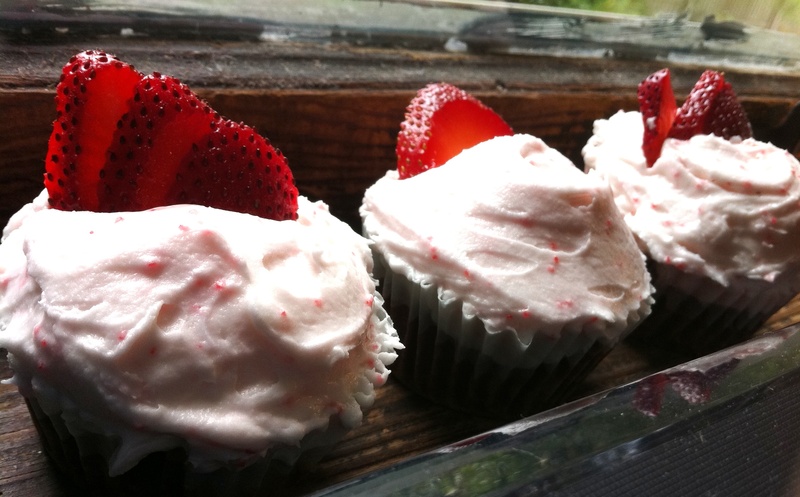 Your turn to try out these vegan strawberry chocolate cupcakes! Oh and a real quick side note. Please please please bare with me as I figure out how the hell to take good food pictures. Food blogs are straight up stupid without mouth watering pictures but it maybe be a few weeks before I find the right lighting and back drop (my old orange VF vinyl player will have to do for a back drop for now). Putting your freshly baked cupecakes into some nice wrappers certainly finishes them off. However to make them extra special there is nothing like making your very own cupcake wrappers. These can be personalised to the individual and the event, plus they are so easy to make. I share my free templates over at http://bestcupcakewrappers.com.